An in-depth look at the VXLAN network stack and VTEP to VTEP communication testing. Virtual Extensible LAN – or VXLAN – is the key overlay technology that makes a lot of what NSX does possible. It abstracts the underlying L2/L3 network and allows logical switches to span vast networks and datacenters. To achieve this, each ESXi hypervisor has one or more VTEP vmkernel ports bound the the host’s VXLAN network stack instance. Your physical networking must be configured for an end-to-end MTU of 1600 bytes. In theory it’s 1550, but VMware usually recommends a minimum of 1600. You must ensure L2 and L3 connectivity between all VTEPs. You need to prepare for IP address assignment by either configuring DHCP scopes or IP pools. If your replication mode is hybrid, you’ll need to ensure IGMP snooping is configured on each VLAN used by VTEPs. Using full Multicast mode? You’ll need IGMP snooping in addition to PIM multicast routing. This can sometimes be easier said than done – especially if you have hosts in multiple locations with numerous hops to traverse. Testing VXLAN VTEP communication is a key troubleshooting skill that every NSX engineer should have in their toolbox. Without healthy VTEP communication and a properly configured underlay network, all bets are off. I know this is a pretty well covered topic, but I wanted to dive into this a little bit deeper and provide more background around why we test the way we do, and how to draw conclusions from the results. Multiple network stacks were first introduced in vSphere 6.0 for use with vMotion and other services. There are several benefits to isolating services based on network stacks, but the most practical is a completely independent routing table. This means you can have a different default gateway for vMotion – or in this case VXLAN traffic – than you would for all other management services. Each vmkernel port that is created on an ESXi host must belong to one and only one network stack. When your cluster is VXLAN prepared, the created kernel ports are automatically assigned to the correct ‘vxlan’ network stack. Welcome to the fourteenth installment of a new series of NSX troubleshooting scenarios. Thanks to everyone who took the time to comment on the first half of the scenario. Today I’ll be performing some troubleshooting and will show how I came to the solution. In the first half, our fictional customer was trying to prevent a specific summary route from being advertised to a DLR appliance using a BGP filter. Every time they added the filter, all connectivity to VMs downstream from that DLR was lost. The filter appears correct. The summary route is a /21 network that comprises all eight /24s that were assigned to logical switches. You can also see that GE and LE (greater than/less than) values were not specified, so the specific summary route should be matched exactly. After publishing the changes, we saw that all BGP routes were removed from the DLR. It’s almost as if the filter stopped ALL route prefixes from making it to the DLR rather than just the one specified. Wait, did it? Welcome to the fourteenth installment of my NSX troubleshooting series. What I hope to do in these posts is share some of the common issues I run across from day to day. Each scenario will be a two-part post. The first will be an outline of the symptoms and problem statement along with bits of information from the environment. The second will be the solution, including the troubleshooting and investigation I did to get there. Let’s have a quick look at what this fictional customer is trying to do with BGP. The design is simple – a single ESG peered with a single DLR appliance. The /21 address space assigned to this environment has been split out into eight /24 networks. The mercury-esg1 appliance has two neighbors configured – the physical router (172.18.0.1) and the southbound DLR protocol address (172.18.8.4). Both the ESG and DLR are in the same AS (iBGP). As you can see, on mercury-esg1 a summary static route has been created with the DLR forwarding address as the next hop. This /21 summarizes all eight /24 subnets that will be assigned to the logical switches in this environment. Because the customer wants more specific /24 BGP routes to be advertised by the DLR, this is what is referred to as a floating static route. Because it’s less specific, it’ll only take effect as a backup should BGP peering go down. This is a common design consideration and provides a bit of extra insurance should the DLR appliance go down unexpectedly. Welcome to the thirteenth installment of a new series of NSX troubleshooting scenarios. Thanks to everyone who took the time to comment on the first half of the scenario. Today I’ll be performing some troubleshooting and will show how I came to the solution. As you’ll recall in the first half, our fictional customer was having issues re-deploying ESGs and DLRs that had been removed from the vCenter inventory. This was all part of a cleanup activity that occurred due to a SAN outage. Not a very informative error message. We’ll need to refer to the logging to find out more. To begin, we’ll really need more information on exactly why NSX is failing to re-deploy these ESGs and DLRs. The message in the UI is not very informative. As mentioned, there are no failed tasks in the vCenter recent tasks pane when an attempt is made, so we’ll need to go digging into the logging to find out more. Managed object id datastore-26 of type Datastore was not found in VC. Welcome to the thirteenth installment of my NSX troubleshooting series. What I hope to do in these posts is share some of the common issues I run across from day to day. Each scenario will be a two-part post. The first will be an outline of the symptoms and problem statement along with bits of information from the environment. The second will be the solution, including the troubleshooting and investigation I did to get there. The SAN suffered a catastrophic failure. All of the LUNs were continuously replicated to another SAN over the years, so these replicated LUNs were presented to the hosts in the compute-a cluster. After a rescan, the VMFS volumes were re-signatured and the datastores and all files were again accessible. All of the VMs on those datastores were manually added back to the vCenter Inventory except the DLRs and ESGs. All DLRs and ESGs were deleted from the datastore so that they could be freshly re-deployed. The customer did realize that in point number 5 above that any ESGs re-added to the inventory would no longer be valid because of mismatched UUIDs. Deleting these from disk and re-deploying was a good idea. NSX is throwing many high and critical events because of the missing ESG and DLR appliances, as expected. There are six appliances in total, including three DLRs and three ESGs. Welcome to the twelfth installment of a new series of NSX troubleshooting scenarios. Thanks to everyone who took the time to comment on the first half of the scenario. Today I’ll be performing some troubleshooting and will show how I came to the solution. As you’ll recall in the first half, our fictional customer was getting some unexpected behavior from a couple of firewall rules. Despite the rules being properly constructed, one VM called linux-a3 continued to be accessible via SSH. The two rules in question – 1007 and 1008 – look to be constructed correctly. VM linux-a2 seems to be working correctly and SSH traffic is blocked. VM linux-a3 doesn’t seem to respect rule 1007 for some reason and remains accessible via SSH from everywhere. Host esx-a3 where linux-a3 resides doesn’t appear to log any activity for rule 1007 or 1008 even though those rules are configured to log. The two VMs are on different ESXi hosts (esx-a1 and esx-a3). VMs linux-a2 and linux-a3 are in different dvPortgroups. How can the two VMs have proper IP connectivity in VXLAN and VLAN porgroups as observed? Is the DFW working at all on host esx-a3? Did the last rule publication make it to host esx-a3 and does it match what we see in the UI? Is the DFW (slot-2) dvfilter applied to linux-a3 correctly? Welcome to the twelfth installment of my NSX troubleshooting series. What I hope to do in these posts is share some of the common issues I run across from day to day. Each scenario will be a two-part post. The first will be an outline of the symptoms and problem statement along with bits of information from the environment. The second will be the solution, including the troubleshooting and investigation I did to get there. To get started with this scenario, we’ll most certainly need to look at how the DFW rules are constructed to get the desired behavior. The immense flexibility of the distributed firewall allows for dozens of different ways to achieve what is described. The VM linux-a2 is currently on host esx-a1 with IP address 172.16.15.10. It’s sitting on a logical switch. The VM linux-a3 is currently on host esx-a3 with IP address 172.16.15.11. It’s sitting on a VLAN backed dvPortgroup. There are a couple of interesting observations above. The first is that both VMs have a security tag applied called ‘Linux-A VMs’. The other is a bit more of an oddity – one VM is in a distributed switch VLAN backed portgroup called dvpg-a-vlan15, and the other is in a VXLAN backed logical switch. Despite this, both VMs are in the same 172.16.15.0/24 subnet. Cross-vCenter NSX is an awesome feature. Introduced back with NSX 6.2, it breaks down barriers and allows the spanning of logical networks well beyond what was possible before. 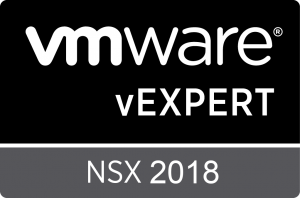 Adding and synchronizing additional secondary NSX managers and their associated vCenter Servers is a relatively simple process and generally just works. But what about moving a secondary back to a standalone manager? Not quite so simple, unfortunately. The process should be straight forward – disconnect all the VMs from the universal logical switches, make the secondary manager a standalone and then go through the documented removal process. From a high level, that’s correct, but you’ll be stopped quickly in your tracks by the issue I outlined in NSX Troubleshooting Scenario 7. Before a secondary NSX manager can become a standalone, all universal objects must be removed from it. Now, assuming Cross-VC NSX will still be used and there will be other secondary managers that still exist after this one is removed, we don’t want to completely remove all universal objects as they’ll still be used by the primary and other secondaries. Remove all VMs from universal logical switches at the secondary location. Use the ‘Remove Secondary Manager’ option from the ‘Installation and Upgrade’ section in the vSphere Client. This will change the secondary’s role to ‘Transit’ and effectively stops all universal synchronization with the primary. Remove all universal objects from the new ‘Transit’ NSX manager. These universal objects were originally all created on the primary manager and synchronized to this one while it was a secondary. Once all universal objects have been removed from the ‘Transit’ manager, it’s role can be changed to ‘Standalone’. Much of the confusion surrounding this process revolves around a transitional NSX manager role type aptly named ‘Transit’. When a manager assumes the ‘Transit’ role, it is effectively disconnected from the primary and all universal synchronization to it stops. Even though it won’t synchronize, all the universal objects are preserved. This is done because Cross-VC NSX is designed to allow any of the secondary NSX managers to assume the primary role if necessary. Using REST API calls to limit NSX user permissions to specific objects only. There is a constant stream of new features added with each release of NSX, but not all of the original features have survived. NSX Data Security was one such feature, but VMware also removed the ‘Limit Scope’ option for user permissions in the NSX UI with the release of 6.2.0 back in 2015. Every so often I’ll get a customer asking where this feature went. The ‘Limit Scope’ feature allows you to limit specific NSX users to specific objects within the inventory. For example, you may want to provide an application owner with full access to only one specific edge load balancer, and to ensure they have access to nothing else in NSX. The primary reason that the feature was scrapped in 6.2 was because of UI problems that would occur for users restricted to only specific resources. To view the UI properly and as intended, you’d need access to the ‘global root’ object that is the parent for all other NSX managed objects. VMware KB 2136534 is about the only source I could find that discusses this. Although the ‘Limit Scope’ option was removed from the UI in 6.2 and later, you may be surprised to discover that the API calls for this feature still exist. To show how this works, I’ll be running through a simple scenario in my lab. For this test, we’ll assume that there are two edges – mercury-esg1 and mercury-dlr that are related to a specific application deployment. A vCenter user called test in the vswitchzero.net domain requires access to these two edges, but we don’t want them to be able to access anything else. We want to limit access to only edge-4 and edge-5 for the ‘test’ user. The two edges in question have morefs edge-4 and edge-5 respectively. For more information on finding moref IDs for NSX objects, see my post on the subject here.